I used two patterns I already had. The top is Grainline Linden Sweatshirt (blogged here ). 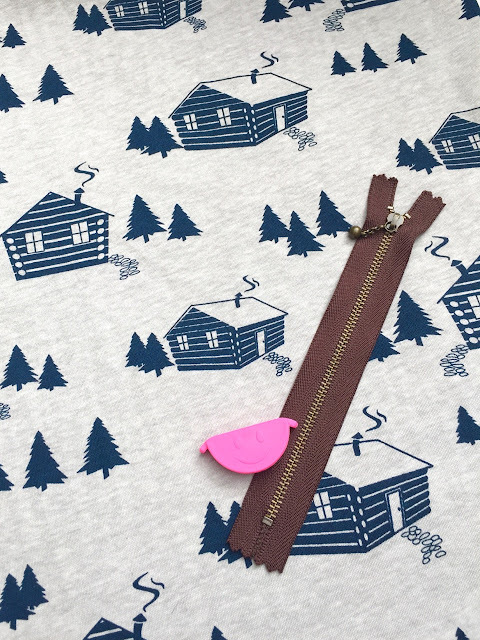 I've made four of these in sweatshirt fabrics and although this is a lighter t-shirt weight cotton/spandex knit, it's an easy and familiar pattern. 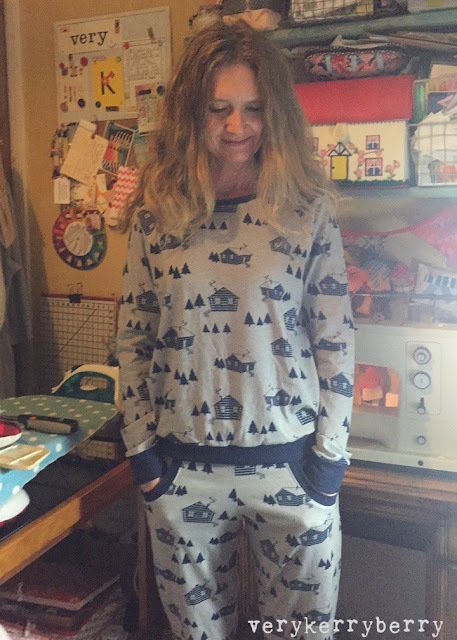 The other pattern was Hallå Lounge Pants.y I've made these once before as yoga joggers but didn't blog them as black garments don't photograph well for sharing. I had two metres of the Homestead jersey which was a guess quantity wise but by using a contrast navy jersey from my stash for most of the cuff bands, I managed to squeeze in both patterns with virtually no scraps remaining. For comfort, 2.5 metres would've been easier, but it was possible with less. 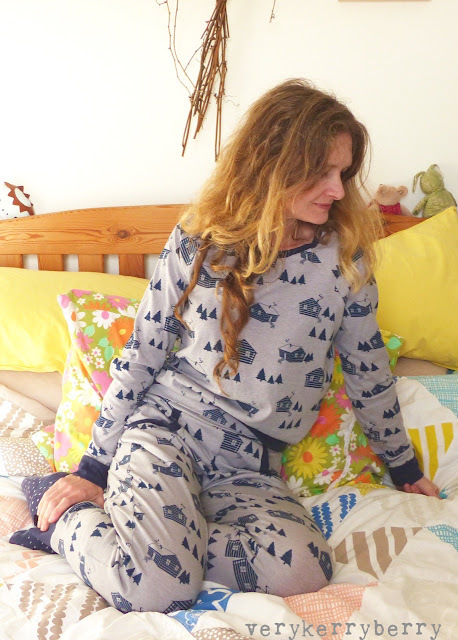 The contrast fabric was Art Gallery knits solids jersey which has the same 95% cotton 5% spandex mix as the Girl Charlee Homestead fabric from the BOLT range but there are some differences. The Art Gallery has a stronger recovery, or bounce back- maybe the knit is a little tighter? The Art Gallery jersey curls up like crazy when cutting, pinning or sewing, whereas as the Homestead fabric lies a little flatter for cutting out and sewing seams, plus it's also more drapey so it hangs nicely. I cut out a size 2 in the Linden and all the bands were cut at a size 2 as well so no changes to the original pattern. I'm a 33" chest and a 36" hip to give you an idea of fit. The lounge pants are a size 2/4 or size 36-38" on the hips. There are multiple options with this pattern, these are the higher rise option (this is pretty low on the belly, but good booty coverage), full length with a tapered cuff and I also tapered the legs from mid-thigh downwards by reducing the side seams. There are lots of additional instructions in the pattern for changing leg width, adjusting hips and much more. The waistband relies on the stretch in the jersey, no elastic or drawstring added but you could add that. It can be folded over a little at the top or worn unfolded. I created pocket bags from the existing pattern pieces but there are patch pockets and scoop pockets included. It's a comprehensive pattern which works well for this relaxed jogger/ PJ pant style and like the Linden, it will get much use over the years! 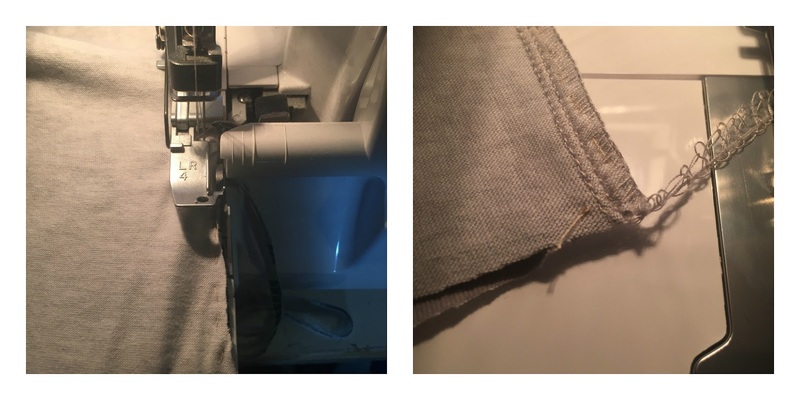 I do find my overlocker tends to struggle keeping the layers even on cotton spandex so the end of the seams can get uneven by up to 3/8", even if I play with the dials so I ended up basting all my seams by hand and it did give a great finish, even if it took a while! This pic was taken just after I'd finished them! 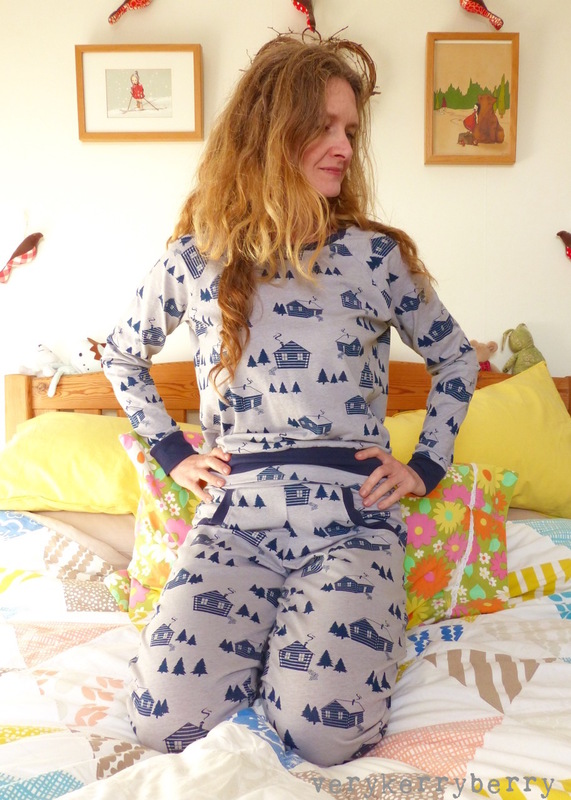 I am thrilled to bits as they look just how I imagined: cosy, comfortable pyjamas, ready for winter evenings! Disclaimer: the jersey was very generously given to me by Girl Charlee as a surprise gift for times we've worked together over the years since the launch of Girl Charlee UK. I chose to write about my experience using it and all opinions are my own. I've been trying a few new sewing related experiences this year. I joined a quilt guild (South West Modern Quilt Guild) which I've loved. I've also aimed to attend more sewing shows so since September, I've been to West Country Quilt show, the 'Stitching, Sewing and Hobby Craft and last Sunday I went to the Knitting and Stitching show at Alexandra Palace, London. This is the biggest show that I've been to and it coincided with a weekend when I was already in London so I thought I'd give it a whirl. 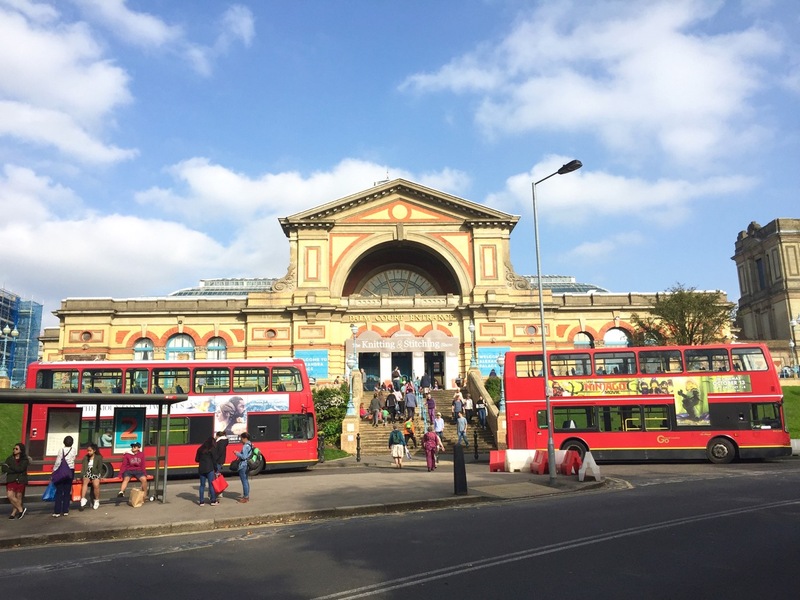 Alexandra Palace is an amazing venue. Sited at the top of an enormous hill, the building is magnificent with spectacular views across London all around. I opted for Sunday as it's the quietest of the show days - it ran Wed-Sun with Saturday being the busiest. I arrived at 10am and there was a steady stream of people going in. Although it sells a range of tickets- VIP, with workshops/talks, as well as standard and concessions really it's about the shopping, all those specialist retailers for quilting, dressmaking, general sewing, knitting, crochet, cross-stitch and more under one roof. 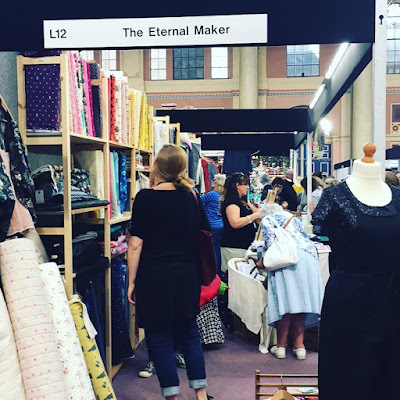 There's one massive hall with the largest stalls and two smaller stalls which tended to house the smaller independent businesses and textile galleries. There were various discounts for buying online, I got mine from being on the Fashion and Textile Museum mailing list, there is a booking fee though, the total cost is around £12-14 for a basic one day ticket. It is a money-making machine. If you want to find a specific stand, you'd have to pay £4 for a 'guide', or return to the entry point and study the wall diagram. I made sure I covered every path of carpet and aimed to find a list of people who I knew were there who I've worked with in some way over the years. 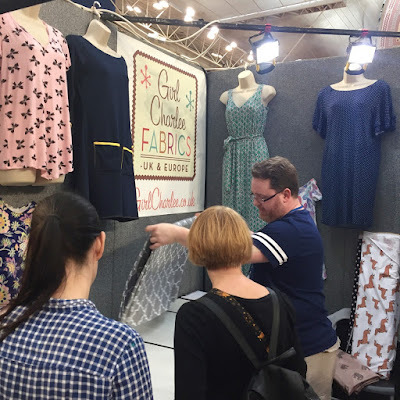 I saw lots of familiar names from previous shows, like Fabrics Galore with their two stalls covering quilting craft and dressmaking, and The Quilted Bear with a plethora of fabric and quilting/sewing tools. I also saw newer names- Higgs & Higgs had a wonderful selection of jersey, sweatshirt, linen, cotton and more. Stof & Sill had a well-arranged stall, quite limited variety but interesting, well displayed and staff were helpful. 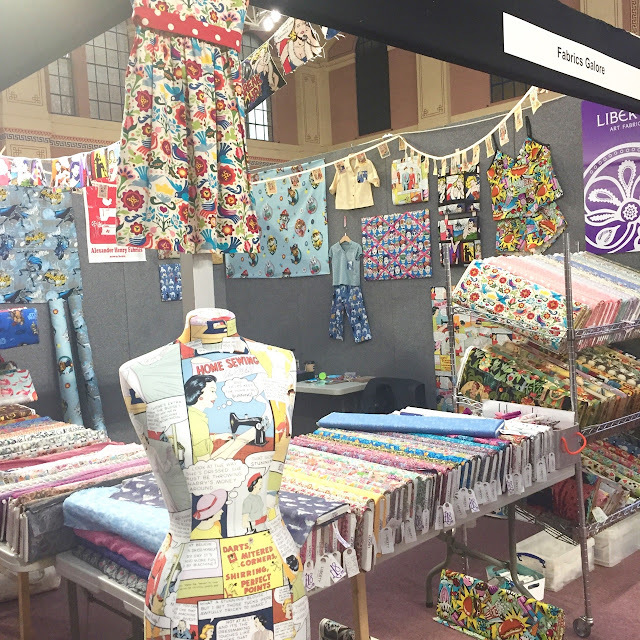 Girl Charlee had a busy stall with a mix of their familiar and new jersey fabrics. I've worked with Girl Charlee several times since they started their UK journey and it's always been a very positive experience. Mark and Ben are both focused on a great customer experience and it really showed when I saw them helping newer sewers match their patterns to the right fabric. 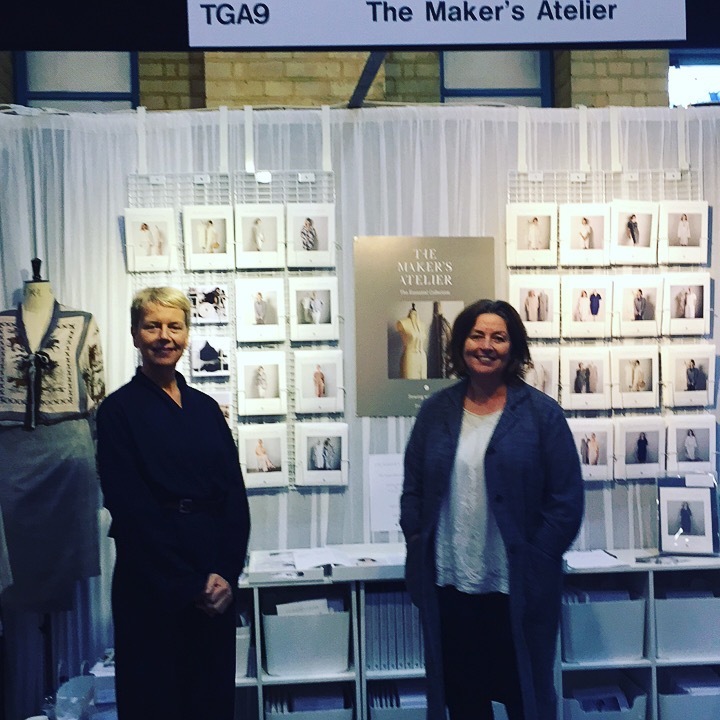 I've worked with The Eternal Maker for many years now and Anna is an experienced stall arranger; there's always so much packed into her displays with a buzz of people around the fabrics, pattern and sample garments. 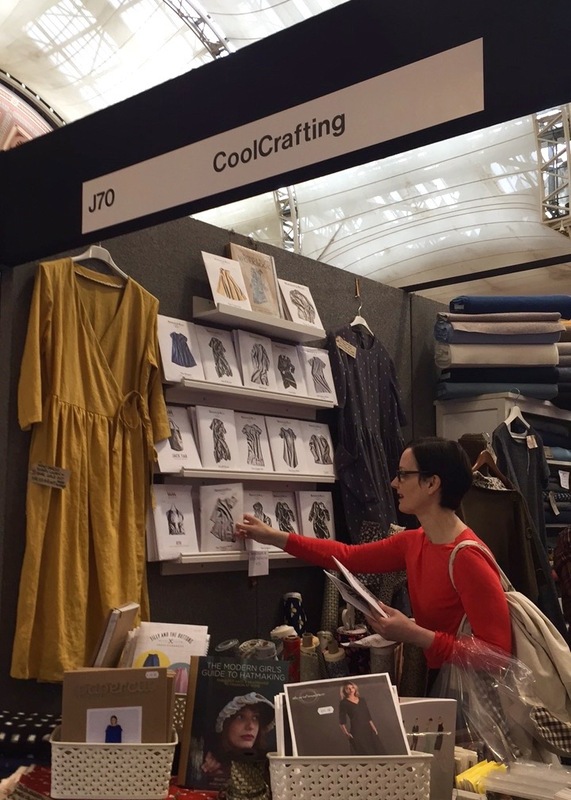 The Cool Crafting stand looked very inviting and they had obviously sold a lot of fabric, kits and patterns - the wrap dress and its fabric had sold out. I've seen their stall at previous events but toy kits, craft fabrics and trims have been their focus. 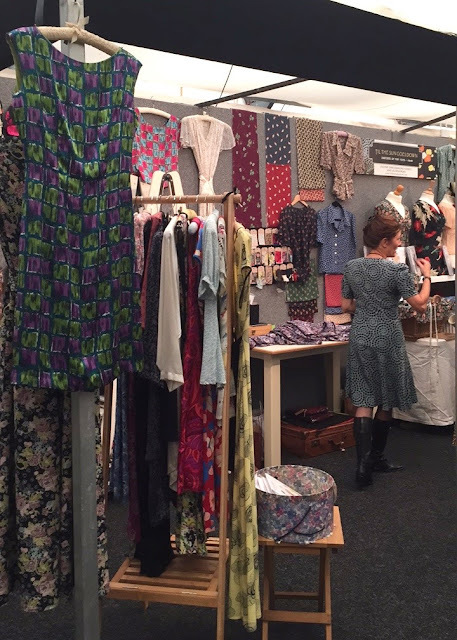 This time, dressmaking was centre stage and they had beautiful cotton, linen and wool selection. In one of the side halls, there were some interesting indie style stalls including Frances Tobin from The Maker's Atelier. I wrote about her business early last year for Sewing World mag and she has expanded so much since then with so many more patterns and a successful book. Her stall was beautiful, a palette of caramels and gorgeous patterns. She likes to use an interesting range of tactile substrates like stretch metallics, silk crepes, leather etc. Grace from Beyond Measure had a lovely stall, packed full of handcrafted sewing gadgets, rolls of wool tweed and an excess of sewing related gifts. It looked very inviting. She had her sister helping her on Sunday, it is a big time commitment running a stall for 5 days plus the set-up and take down, whilst also being away from your family. Andree of Til the Sun Goes Down sells a dazzling range of original design silks and wool crepes as well as her own pattern range, 'Now and Then' and tempting kits which combine the two. She had vintage patterns and fabrics too and all her patterns were made up in a multitude of samples. 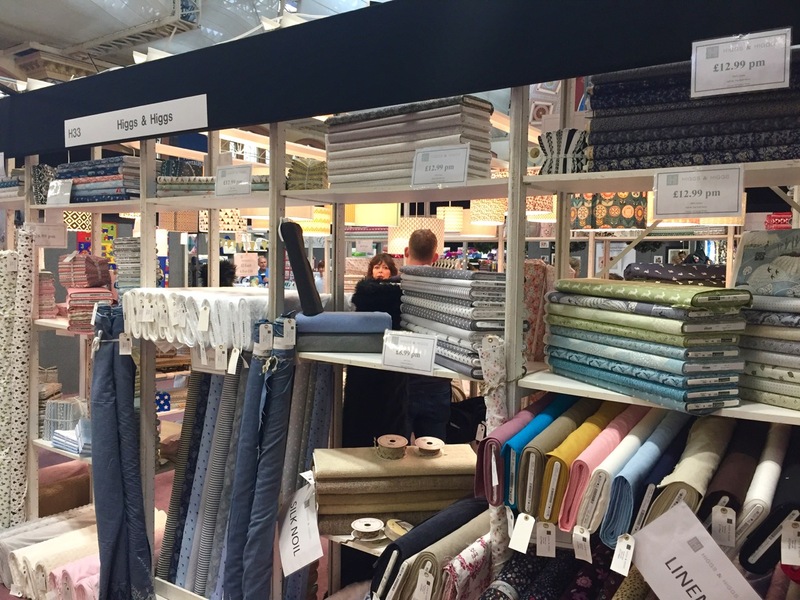 For a huge array of the best known names in sewing, it was excellent. I'm no longer a knitter and I can't crochet but both are well served. I didn't buy much, it was more about meeting some people after a long time emailing and enjoying the experience plus my budget is limited and I was carrying my luggage on the train the next day. I did get some irresistible Homestead Life Cabin Bolt fabric from Girl Charlee which is destined to become jogger style pyjamas. 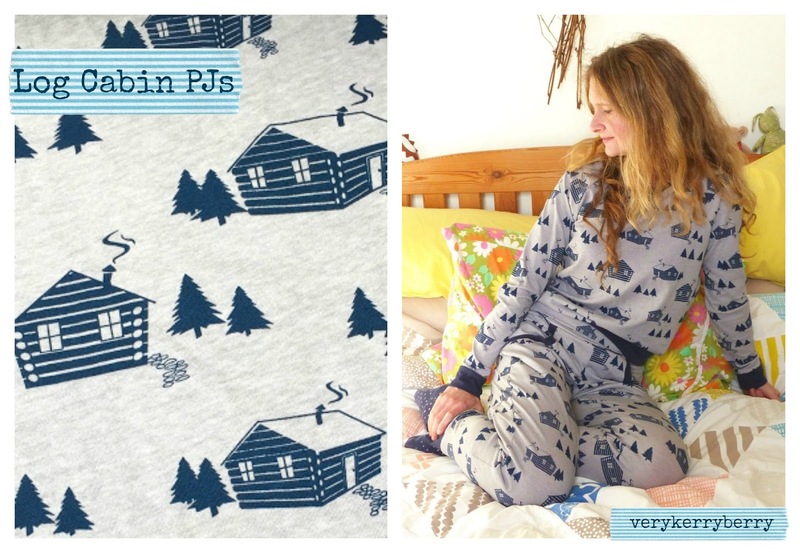 Love the print and it's a slightly drapey cotton/spandex jersey, perfect for lounging and evening quilt snuggling. I also picked up a short Japanese zip and a mini magnetic seam guide from a couple of sewing stalls. There were a few odd stalls selling sweets or hair clips- the sort of thing that I see a frustrating amount of at smaller shows and are in no way related to sewing or knitting. It's a long week for the stall holders too and I did feel for them although there is a comradery amongst the stalls and it is great for catching up on news about the business. Some traders reported fewer sales or a lower spend by customers than previous years because of the recent Great British Sewing Bee Live event in September, whilst others said they weren't affected. The exhibitions were wide-ranging and interesting as well as a break from the busier areas. 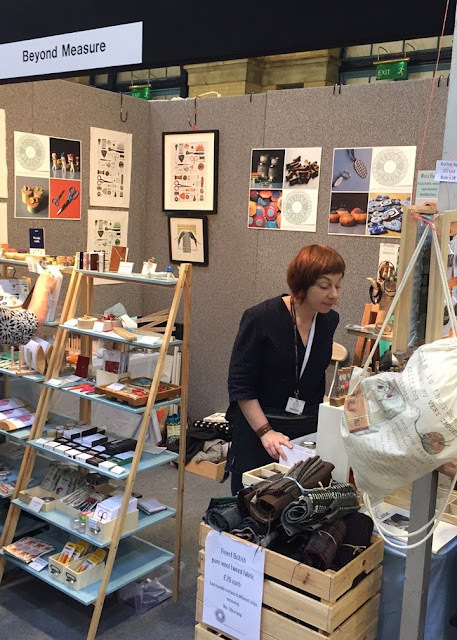 I felt like I missed some though with the lack of having a map to hand but from the ones I did visit, standouts included Rachael Howard's Red Work, Diana Harrison's Traces in Cloth which I found rather dramatic to look at, and Amy Twigger Holroyd's reknitting gallery. It was fun, I spent a very happy four hours there and I did get to see all the shops in person that I only ever usually visit online. Are there any shows that you would recommend? Spelling Bee Quilt-Along...Are you taking part? 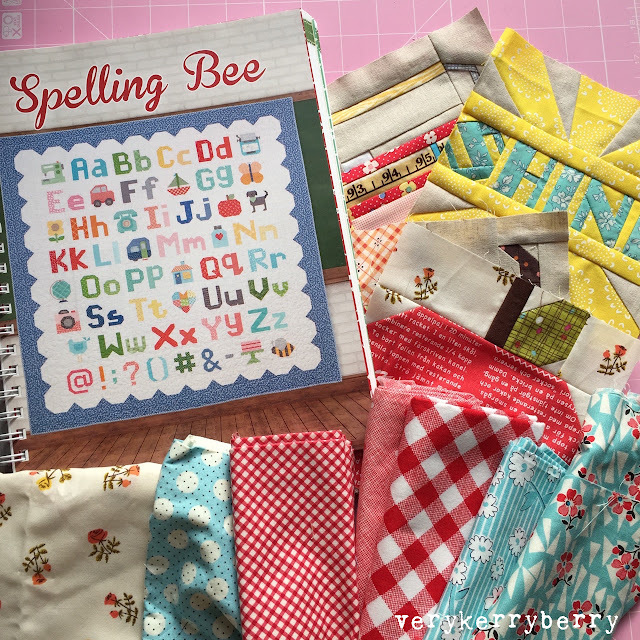 I reviewed Lori's Holt's new Spelling Bee book a couple of month's back and as with all her books, there's a sew-along run with the Fat Quarter Shop. It's for the cover quilt but there are other quilts in the book that you could focus on instead- e.g. the Picture Day Quilt focuses on the images in the book and can either be a multitude of different pictures, or the same repeated in a different colourway, maybe adding initials too. I'm one of forty bloggers taking part; I've chosen three blocks but the first isn't until January. I'm getting prepared now as I want to make some of the other blocks too! There are crib or twin options depending on whether you make 6" or 12" blocks and I'm also going to combine some Sew-Ichigo blocks that I think would work. Making a smaller quilt makes the schedule a little more forgiving if you struggle for time and there are different sashing suggestions or even mini quilt layouts that could be used for a small selection of blocks (Lori shows some in a picture at the end of this post).